It's beginning to look a lot like Christmas, especially at Universal Orlando Resort. The Halloween pumpkins have been removed and replaced with garlands and ribbons galore. Universal Orlando gets a magical makeover, especially in the Wizarding World of Harry Potter. 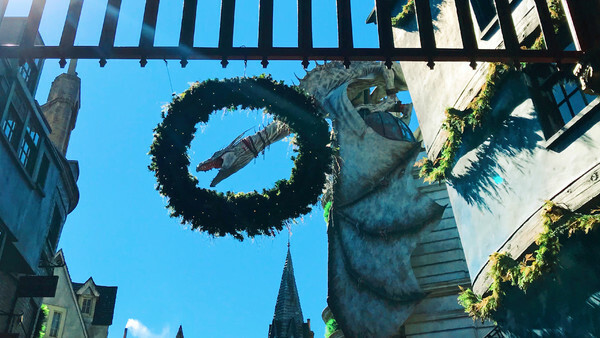 It seems only fitting that Hogsmeade and Diagon Alley should celebrate the holidays. 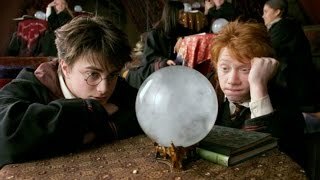 Christmas has always been celebrated grandly in J.K. Rowling's books and with the movies showing each evening over the holiday season, it's not hard to think of Harry Potter as a festive treat. So really, why resist it? Ask Santa Claus to put tickets to Universal's Wizarding World Of Harry Potter under your tree this Christmas. It's truly a magical gift. As perfect as the Wizarding World of Harry Potter is at other times of the year, it's Christmas when it truly comes to life. Both Diagon Alley and Hogsmeade are decorated with Holiday decorations galore over the festive season. Each shop has its own decorations outside, as if the shopkeepers have dressed the stores themselves. It's wonderful to look around and spot the individual ornaments. Weasley's Wizard Wheezes has fireworks as part of its decor, the Daily Prophet has a wreath made from a letterpress and Madam Malkin's has ribbon woven into its garlands. Even Knockturn Alley gets its own dark wreath over the entrance way. No area has been completely missed out when decorating the Wizarding World of Harry Potter. With its already snow covered buildings, Hogsmeade comes into its own over Christmas. The festive backdrop is perfect and even Hogwarts Castle receives an evening makeover, but more on that later.